One body size in three force sizes EN2-3-4 for doors 750 -1100 mm. wide. Adjustment in all directions within the cement box to help solve the problems of uneven floors without taking down the door. Pivot point 55 - 65 mm. without re-locating the cement box thanks to one only template. Particularly user friendly in case of double action glass doors. Vertical adjustment within the cement box in addition to possibility of extended spindle. Hydraulic control over ˜175° in both swings. Handed version with control from 180° available on request. Closing speed controlled by two easily adjustable non critical valves. 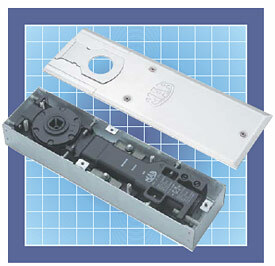 Soft closing or powerful latching action adjusted by valve to ensure proper closing also in case of hard to latch locks. Interchangeable spindle from 0 to + 25 mm. Architectural finishes: coverplates in polished s/steel, satin s/steel, polished brass, INOTTONE (brass finished inox enhanced by PVD treatment). Versions force EN3-4, without Hold Open, have CE conformity.